Okay, we run a lot of Google AdWords campaigns. We know a bit about them. b) Convert more visitors to sales once they get to your site. 1. You match up your ad with what the person is searching for. 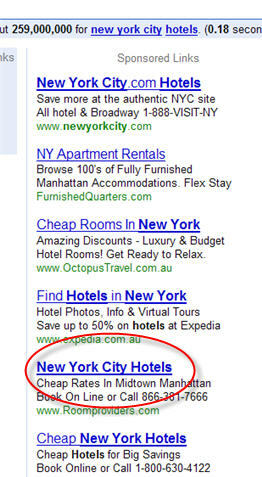 So if they’re searching for ‘new york city hotels’ then your ad heading needs to be New York City Hotels. 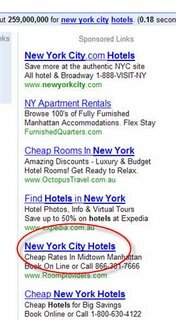 See the example circled in red taken from a screen shot of Google AdWords results when I searched for ‘new york city hotels’. It’s been our experience that that ad will get almost double the visitors of the ads directly above or below it. This one is specific to pay per click advertising (and works with search engine optimization as well). Create landing pages targeted to what the visitor searched for. Don’t Send Me To Your Home Page! Don’t send me to your generic home page! I gave you the absolute specifics on what I wanted – you’ll increase your sales if you listen and give me what I want. Don’t hinder me by shuffling me off to a page that isn’t relevant or is further away from the information I’m after. That will increase your sales by a solid 30%+ in our experience.